We don’t measure ourselves on how many loans we close. We measure ourselves against the values that created this company. We take your opinion seriously, and team members that deliver on our promise are rewarded. Choose the site where you will leave a review. 1. Go to www.yelp.com. 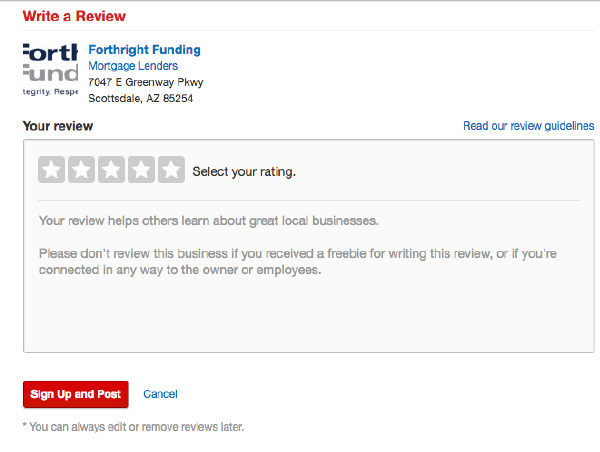 Once the site is loaded, type “Forthright Funding” into the Find bar, and “Scottsdale, AZ” into the Near bar. 2. While on the Forthright Funding Yelp page, tap the red button. The button is located in the upper middle section of the page. 3. 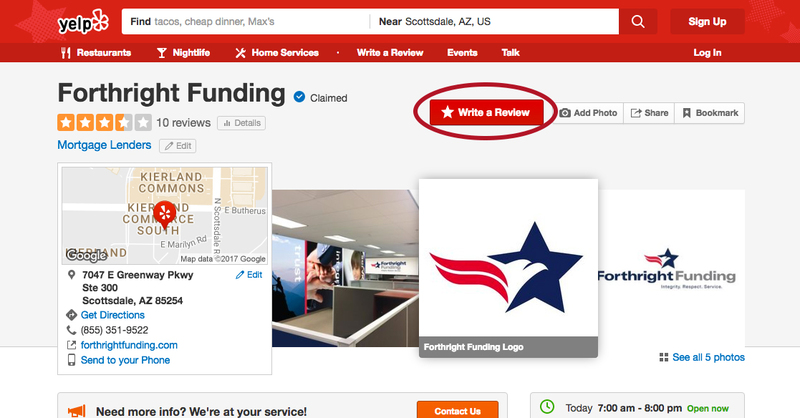 On this page, you are now able to select a star rating and write your review of Forthright Funding. Once your review is complete, hit the red button to publish your review. 1. Go to www.google.com. 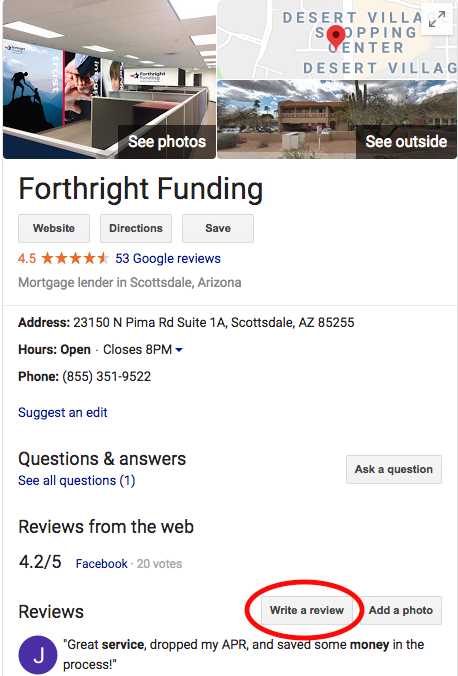 In the search bar, type in “Forthright Funding”. Once the page is loaded, click the small grey button, located within the right-hand box containing the business’s information. 2. If you are not logged into your Google account, you will be prompted to do so now. 3. 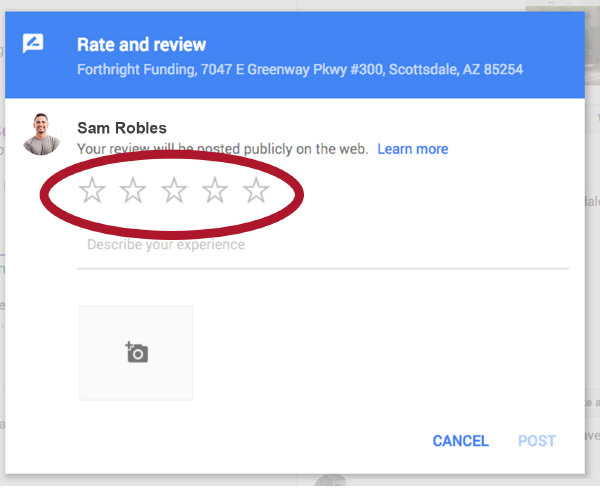 Once logged in, you will be able to select a star rating and write your review of Forthright Funding. 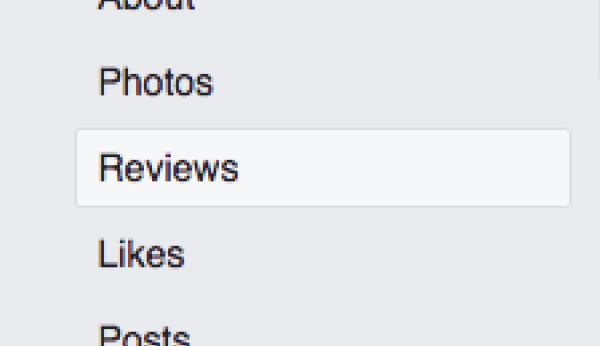 Once your review is complete, hit the white button to publish your review. 1. Go to www.facebook.com. Once the site is loaded, type “Forthright Funding” into the search bar located in the top left-hand corner. 2. Click Reviews in the far left-hand column. 3. 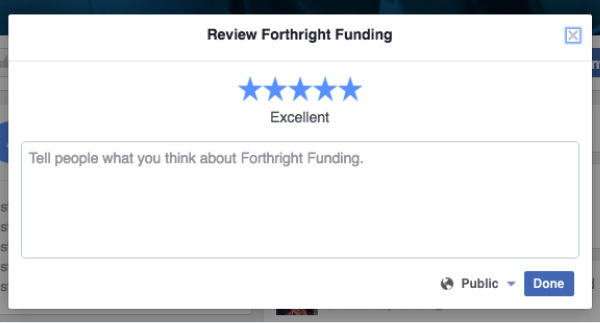 Click the gray stars to choose a rating for Forthright Funding. 4. Once you have selected a rating, you can write your review. Upon completion, click the blue button to post your review.